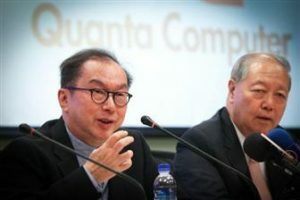 ODM Quanta Computer has been engaged in R&D of VR (virtual reality), AR (augmented reality) and MR (mixed reality) solutions through cooperation with clients, as well as cloud-based devices and services specifically for use in medical care through cooperation with Taipei Medical University, according to company chairman Barry Lam. There are concerns that Taiwan has so far behind in development of AI (artificial intelligence) and 5G mobile communication technologies, Lam said. 5G will drive wide use of edge computing which, in turn, will cause large demand for servers, Lam noted. The impact of tablets and smartphones on demand for notebooks is decreasing, because major software applications, such as Microsoft Office 365, are not as convenient to use on tablets or smartphones, Lam explained. Thus, global demand for notebooks is likely to rebound, Lam said. Quanta shipped 9.2 million notebooks in the first quarter of 2017, growing 9.5% on year, and expects shipments in the second quarter to increase 10% on quarter, and continue to rise in the third. Quanta’s shareholder passed the proposed distribution of a cash dividend of NT$3.50 (US$0.116) for 2016, accounting for 89.06% of the corresponding net EPS of NT$3.93.